This is my unpaid, unsponsored review of the Leesa brand foam mattress. We bought the mattress with our own money, based off our own research – Leesa didn’t pay me in any way for this review, and frankly doesn’t even know I’m writing it. The thoughts and opinions here are real, unsolicited and totally my own. There are SO many mattresses and reviews out there – it’s overwhelming to look at them all! I did a lot of research to arrive at the Leesa mattress, so I thought I would gather together my thoughts and opinions to add to the content available on the web for foam mattress reviews. The only difference is that this review is unsolicited, unsponsored, and totally honest. To be clear, I did sign up to be an affiliate for Leesa, which mean you would get 15% off by purchasing a Leesa mattress through this link, and I get a couple bucks in commission if you do. But, this is my honest opinion, based on our experience with the bed and you’ll see that I’m bringing up some real issues and experiences here, not just talking glowingly of a product because I was paid to do so. 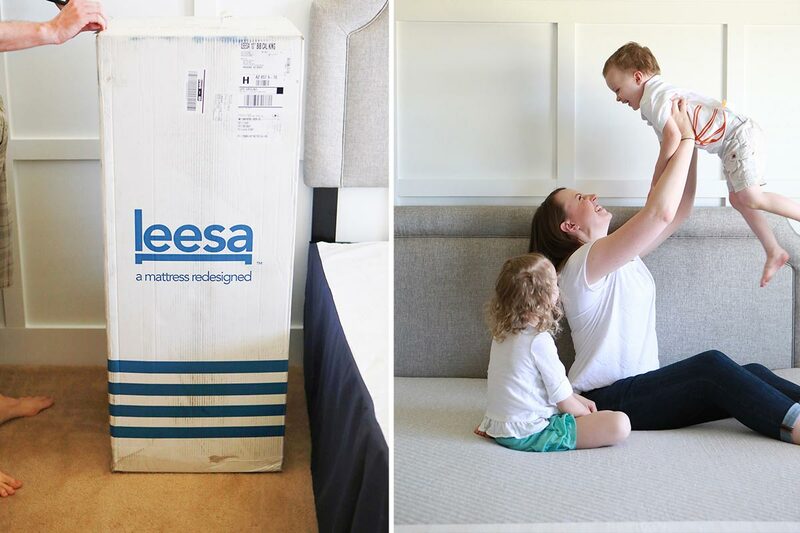 We got our Leesa Mattress in the mail last month – and I had my friend come over to take photos of our unboxing process! It is CRAZY how such a big mattress can come out of a box, but also really fascinating. Now that we’ve slept on it for a bit, here are my thoughts. It comes in the mail – in a box – with free shipping. The fact that Leesa comes in the mail is super convenient – no setting up a delivery window, renting a truck to get it yourself, etc. The box is surprisingly small – and it’s frankly fascinating to see it expand to full size when you open it! It’s supportive and doesn’t sleep hot. Leesa is a really high quality mattress. They aren’t skimping on the materials, and it’s clearly well made. The multi-layer foam is super soft to the touch, but it also firmly supports your weight. It doesn’t cave in like a lame foam camping pad – it seems to just push back according to how heavy you are. It’s not memory foam, but a proprietary foam. I was also super concerned about the mattress sleeping hot. We live in Arizona and bought this in the summer, so we really gave it a fair trial. We are already paying an arm and leg to keep the house cool – so we can’t be sweating from our mattress as well. I’m happy to say that Leesa sleeps very cool. I’d probably say it’s neutral to cool – I don’t think it would make you shiver in the winter! But temperature-wise, it’s been heavenly. Not once have I woken up sweaty or too hot in the last two months. Leesa’s 100-night free trial period. We slept on the Leesa for a good 60+ days before we decided if we were going to keep it or not. Their 100-day trial period is awesome! Laying on a mattress in a store for a few minutes with a high pressure salesman isn’t really my style. I would much rather get a real opinion of the mattress because I’ve had it in my home and life. I think every online mattress company has a similar trial period, and I’m not sure I would buy a mattress without one. The price is right – Queen, King, & California King for around $1000. We looked at a lot of beds, and most were simply too expensive for what we wanted to spend. I understand the argument for “you spend a lot of time in bed, so get a good one”… but that still didn’t change the fact that we didn’t want to spend a lot more than $1000 on a bed. This is an even bigger deal because we love the California King Bed size for our height, which is usually several hundred dollars more expensive than the fairly standard Queen size. It’s not the cheapest mattress we saw, but I worry when mattresses feel too “cheap” – will it be awful? Will it sag in 6 months? This pricing felt like a deal compared to most of the other mattresses we were seeing, and I was pleased with it. It’s good “middle ground” for couples that have different firmness preferences. I’m a side sleeper and my husband is a back sleeper. From the research we did, Leesa seemed like the best option for couples. (We heard Tuft & Needle would likely feel too firm for side sleepers, and other brands would be too soft for back sleepers). Sometimes those pillow top mattresses are so tall that your regular sheets don’t fit it! I didn’t want to spend a ton of money replacing all our sheets, so I’m glad it came in a standard 10″ height. It doesn’t require a box spring or foundation, which means tons of under-bed storage! We used to have a regular side box spring, which meant we had all of 6 inches of storage under the bed. Switching to Leesa meant we could ditch the box spring and use a slatted bed frame. I bought this this extra-high bed frame from Amazon and I am LOVING having 17 inches underneath the bed now. It only raised the total height by a few inches, and gave me the ability to put 8-12 bins UNDER my bed. Seriously, so worth it! Foam mattresses have no edge support. This they sink down a lot when you sit on the side. This is, of course, true for ALL foam and memory foam mattresses, so it’s not really Leesa’s problem as much as a drawback to foam in general. The lack of edge support isn’t a deal breaker – it just takes some getting used to. It might bother you more if you have trouble getting in/out of bed, or if you sit on the edge of bed a lot to put on your shoes, etc. Our favorite pillows weren’t quite right for the support it provided. We have $50 pillows that we’ve had for years and LOVE. But when we switched to the Leesa, my husband felt like his pillow was no longer right for the bed. We think it’s because the Leesa was providing support in a different place than our old mattress, so he needed a flatter pillow. This isn’t a deal breaker either – he just switched to a flatter pillow we already had. I think this is just evidence that the Leesa provides support in a lot more holistic way, so you don’t need a lot of extra to feel comfortable. Foam is not for everyone. The feeling of a foam mattress is just SO different than a regular mattress. Overall, we LOVE it, but it just feels… different. It’s hard to explain. It’s not as bouncy as a spring mattress feels – which is obvious, but needs to be said. It’s not like memory foam either either where you can’t even roll over because you’ve sunk in the bed so much. It’s soft and supportive – I think the word is that it gives a good “hug” when you lay on it, but you’re not going to feel like you’re falling in either. Neither one of us are stomach sleepers – so I feel unqualified to comment on if it’s right for stomach sleepers. You lose most of the convenience factor once you’ve opened the box. There’s a bit of a new mattress smell – this went away quickly (like, two days max) and wasn’t bad smelling. I looked it up and apparently, it’s not off-gassing either, it’s just the way it smells when it’s made. You can’t try it out before you buy (although you get to try it in your home). I don’t consider this a true con, because this really means you get to try out a mattress in the comfort of your own home, on your own timetable. I’d rather that than dealing with a pushy sales person! But, if you insist on trying it in person, you’re going to be out of luck. They do have a cool art gallery in Soho where you can lay on a mattress while viewing art – but I think it’s cheaper just to buy it and return it in 100 days if it’s not right for you. 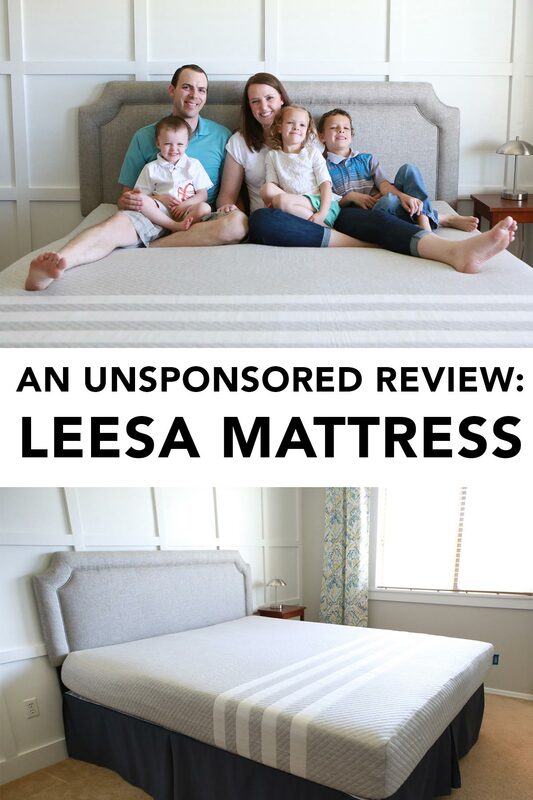 This is an honest, unsponsored review, so I have no problem telling you didn’t keep the Leesa mattress. We slept on if for 60+ days before we decided this. My husband was 100% in love with the mattress and really wanted to keep it. He loved it from day 1, and he’s a back sleeper. I was 90% in love with the mattress – but shouldn’t I be able to 100% LOVE my mattress?! A tiny part of me was worried about some back pain that was popping up. I’m a side sleeper and I like a pretty firm mattress, and the foam was so different than what I was used to. It was a weird phenomenon because my head loved how the mattress felt when I curled up on it at night (cloud-soft!) but in the morning, my body told me it didn’t like it. This could be because of so many things – my height, sleeping position, etc. My chiropractor friend said that mattresses are totally personal preference and you have to do what feels right. So, I gave it a full 60-days, but ultimately decided we had to return it because I wanted to 100% love our mattress. I was pretty bummed about this – I truly loved the the idea of the Leesa. So, that’s my truthful review – It wasn’t right for me, although it was totally right for my husband. I wish it had been just a bit more supportive. But it might be right for you! And Leesa made the return process so easy – we had someone come pick it up, verified that donation, and then our full refund came back a week later. Honestly, I feel a mattress is the type of thing you HAVE to try out for yourself, because you’ll never know how your body reacts. I’d much rather have a peaceful trial period in my own home than deal with pushy salesman in a mattress store. Spending the money initially wasn’t a problem because I knew we could get a 100% refund, and it truly was a hassle-free process. I have no regret spending 60+ nights sleeping on a Leesa because it helped me make a decision that was right for me. Get 15% off your Leesa with this link – the discount is automatically applied at checkout. This makes the queen $845, and the King/California King just $1015. Shipping is always free. You have a budget but want a high-quality product. We used this link to get ours for $1000 shipped, and it will take 15% off any size for you too. If you don’t have a truck to bring home a mattress yourself from the store. If you want to store a ton of stuff under your bed. We bought this super high bed frame, which gives us TONS of room under the bed for storage. If you want a mattress that sleeps neutral to cool. If you love the springiness of a inner coil mattress – foam doesn’t feel the same, and you’ll probably not be happy with ANY bed-in-a-box solution. If you need awesome edge support (because you sit on the side of the bed a lot, or have trouble getting in/out of bed). If you try it and don’t like it. No harm, no foul – return it and get something else! Whew! That was a long post, but I truly wanted to give you an unbiased, unsponsored, honest review of this mattress. I know any mattress is an investment, so I hope this review helped you in your research.